Don't be confused by the incoming Democratic House of Representatives and all of the things the mad media says they will do to to the President while paralyzing government for the next two years or worse. The spirit of 2016, the revolt in the American population which led to Donald Trump’s election, remains alive and very well within the American population. 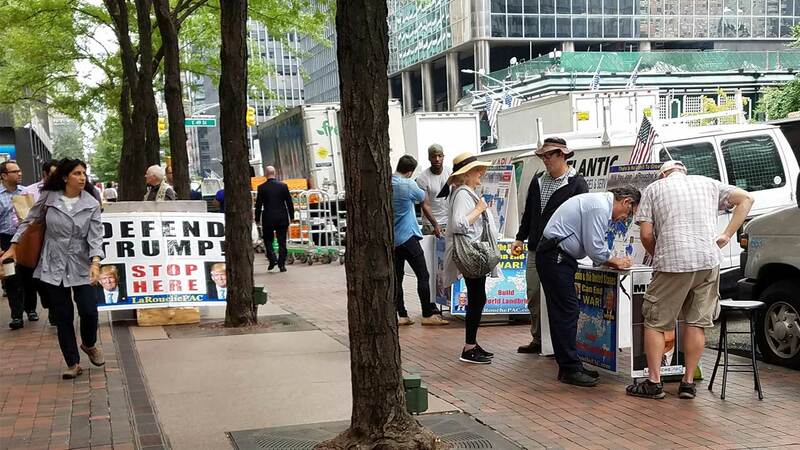 That is what LaRouche PAC found in our 2018 Campaign to Secure the Future, through our campaigns and our interactions with Americans on both coasts, throughout the Farm Belt, and in the Midwest. This remains true after billions of dollars have been spent in attempts to pacify the American rebels, cage or eliminate Donald Trump, and completely buy the Congress. It remains true after an angry and desperate media campaign that turned American icons—star athletes, most of Hollywood, and former leading political and media figures—into insane and frothing versions of their former selves, engaged 24 hours a day in attacking the American President. It remains true after the British and their allies from the former Obama White House directed a two-year coup against an American President and the people who voted for him, in which they attacked our country and fired the full propaganda and psychological warfare arsenal normally reserved for hostile regime change and small wars internationally. LaRouchePAC organizing in Manhattan, 2018. Despite all of that, President Trump emerged from the midterm elections with normal-range losses in the House and a pickup of seats in the Senate, making his impeachment suddenly improbable. The palpable anger of our elites at their multi-billion dollar failure—a failure which should, lawfully, result in a number of them finally going to jail for their participation in a coup against the President—is now being directed anew at confusing you, limiting you to reacting to “the news.” They have no choice in this battle as they are completely exposed; either Trump goes down or they go down. Again, let’s be clear. In 2016-2018, the United States was attacked by a foreign power, the New British Empire of the City of London and Wall Street, an Empire intent on preserving its system from threatened destruction—not just from destruction by the coarse-talking billionaire from Queens, New York, who improbably won the Presidency, but by the aroused and impassioned American people who voted for him and remain determined to return to America’s idea of fundamental human progress: the idea that each generation, by its actions, provides a better and happier future to the one that follows. The same voters and the President are committed to the complete sovereignty of every nation, starting with the United States, and economic relations between sovereign nation states based upon the reciprocal advantage of each. This community of principle, among sovereigns, memorialized by John Quincy Adams, was longstanding U.S. foreign policy. It ended with Harry Truman and the “special relationship” of British brains and American brawn which has led to our endless wars on behalf of British imperial strategic interests, not our own. This is what “Make America Great Again” means. 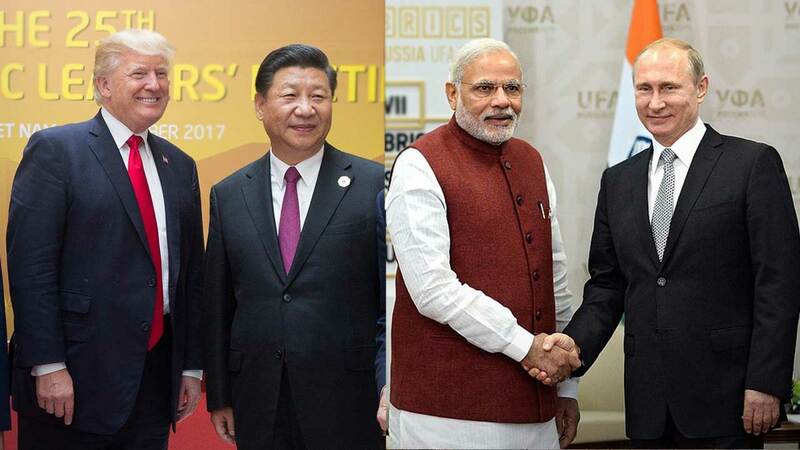 President Trump, Xi Jinping, Modi and Putin. Think about the results of the midterm elections from the standpoint of the New British Empire, that conglomerate of Wall Street, the City of London, and allied institutions, put into place after Franklin Roosevelt’s Bretton Woods monetary system was destroyed by Richard Nixon in August of 1971 and replaced by the floating exchange rate system of globalization. At that moment in 1971, national sovereignty over fundamental economic decisions became a thing of the past; whole nations were at the mercy of free trade, cheap labor privateers, and currency manipulators run by the bankers of the City of London and, to a lesser extent, New York. These financial centers and central bankers now privately controlled the financial flows of the entire world and dictated physical economic policies through globalist institutions like the IMF, World Bank, and World Trade Organization. The Bretton Woods system which was wrecked in August of 1971 had worked quite well. It allowed for stable growth and world-wide development from the end of World War II through, approximately, 1968. Its destruction was followed by the Trilateral Commission’s “Project 1980s” implementation of what they termed the “controlled disintegration of the U.S. economy.” As a result, under the Carter Administration and every presidency up to the election of 2016, the United States was deindustrialized, its unions crushed, its ability to regulate abolished, its middle and working classes decimated, and a cheap-labor, doped-up, miseducated service economy strung together to replace what was once the most powerful economy ever known to humankind. This New World Order was implemented by what some call the Deep State. President Trump calls them the globalists. But they are, more precisely, the New British Empire, the same people who instigated the coup against Trump. But, ever since 2008, this rejiggered new imperial system has been dying a death from natural causes. It cannot replicate itself by producing wealth through productive human labor, let alone open new frontiers of growth and human knowledge. When it collapsed in 2008, it was put on life support by trillions of dollars in bailouts at the expense of the middle and working classes of most advanced sector nations, and now has built a new bigger financial bubble ready to burst, on top of its own ruins. Trillions of dollars circulate in the world economy today under their system, but only 2% of that mass of paper has anything to do with real productive activity. The rest is gambling—pure speculation. Instead of building a productive economy, one which grows exponentially in order to meet the future needs of a growing population, it wields the powerful and well-financed myths of environmentalism and identity politics, along with mass degradation through entertainment, and genocidal wars, in order to depopulate and stupefy whole nations. That is how it has retained its ever slipping death grip on the world’s economy. Just look at California, now engulfed by fires of Biblical proportions. We know how to control the water cycle; we can clear and garden forests, but the environmentalists have insisted, instead, on policies which literally set the state on fire. They now seek to blame nature for their murderous arson. The case is similar with respect to the huge floods and damage from hurricanes which have devastated our states and Puerto Rico. We have not built the infrastructure that would make any damage from natural cycles minimal, because Wall Street speculation robs the economy of the financial flows that could build the flood, wind, and water control projects which have been on the books for decades. Add to this the fact China is now advancing its economy, pulling millions out of poverty, using the same American System methods of Alexander Hamilton, Friedrich List, Abraham Lincoln, and Franklin Roosevelt, which we used to use here in the United States. It is building big infrastructure throughout the world on an advanced platform: huge water projects and high-speed rail, new cities, and high-tech electric grids that will last for the next 50-100 years. It is educating a massive population of scientists, engineers, and artists to meet the challenges of exploring near space and colonizing the Moon, while developing this planet as one suitable for habitation by human beings. The response of the New British Empire is the standard response of all collapsing empires in history: demonization, suppression, and concrete steps to isolate and dominate both Russia and China, a response which can only lead to a World War. 4) a crash program to develop fusion power, the energy source of the future, the energy flux density and power of which allows it to transform raw materials, power entire continents, and power space exploration and colonization.